Vermont's ski-and-ride industry enjoyed one of its three best seasons ever in 2013-14, despite snowfall that was only a bit greater than average and a "polar vortex" that kept temperatures far below average for parts of the winter. Greatly enhanced snowmaking capacity was a key factor, says Parker Riehle, head of the Vermont Ski Areas Association. The resorts' ability to guarantee good conditions through most of the season contributed mightily to the 4.5 million visits they recorded last winter. That was enough to rank Vermont as the third most popular ski-and-ride destination in the country, behind Colorado and California. And in Vermont, snow isn't just white; it's got a lush green complexion, too. Skiing and snowboarding together generate about $1.5 billion a year for the state's economy. In addition to bringing in bucks, the supercharged snow guns lining the slopes are saving the resorts substantial sums of money. And, unlikely as it sounds, these new snow guns are also "green" when it comes to their environmental effects, or at least less polluting than the machines they replaced. Energy efficiency has come to snowmaking — at a cost. An industry-wide turn to snowmaking equipment that uses less electricity will result in a $2 million reduction in total energy costs at the state's ski areas this coming season, says Jim Merriam, director of Efficiency Vermont. A $5 million rebate program initiated by Merriam's conservation-focused consultants kick-started the resorts' $15 million investment in high-efficiency snow guns. "An industry-wide upgrade in snowmaking efficiency of this magnitude has never been seen before," Riehle observes. How will the shift away from energy-devouring equipment benefit the planet? Installation of some 2,300 advanced-technology guns means 2.3 million fewer pounds of carbon dioxide emissions will be spewed into the atmosphere, compared with the output of climate-altering gas by the low-tech equipment. Viewed another way, the resorts will save enough electricity to power 1,500 Vermont homes for one year, according to Efficiency Vermont. "We saw an opportunity to move a market," Merriam says, explaining why his organization offered the one-time-rebate deal. It was also a move that focused attention on Efficiency Vermont, because skiing is as synonymous with the state as maple syrup. 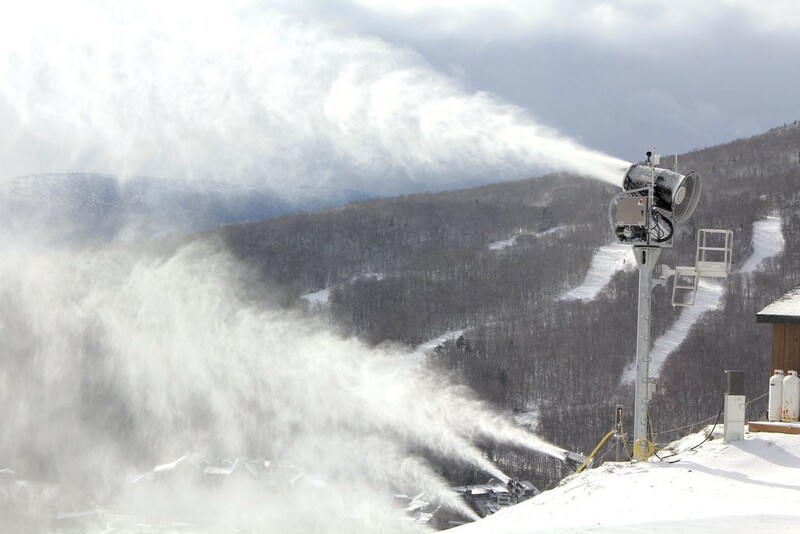 Efficiency Vermont's engineers field-tested 15 of the higher-tech snow-gun models in the winter of 2012 to 2013. That experience enabled the Burlington-based energy experts to devise a formula whereby they provided the biggest rebates for purchase of the most efficient guns. The per-unit size of the rebates ranged from $500 to $4,000. The money for the program came from a surcharge that's slapped onto every electricity bill in the state. Ratepayers thus supply the $45 million annual budget of Efficiency Vermont, which sponsors a number of conservation initiatives in addition to the snow-gun subsidy. The energy savings associated with the new equipment result mainly from a radically reduced reliance on air compression as part of the snowmaking process. Controlling energy costs is the No. 1 challenge facing Vermont ski areas, Riehle notes. And, according to Efficiency Vermont, air compression accounts for 53 percent of the electricity consumed at a typical resort. Lighting buildings, by contrast, represents only 7 percent of a ski area's electricity use. Sugarbush Resort's energy bills amount to about $2 million per year, says spokesman John Bleh. To reduce — or at least stabilize — that outlay, Sugarbush installed 351 higher-tech guns last season at a cost of $1.8 million. 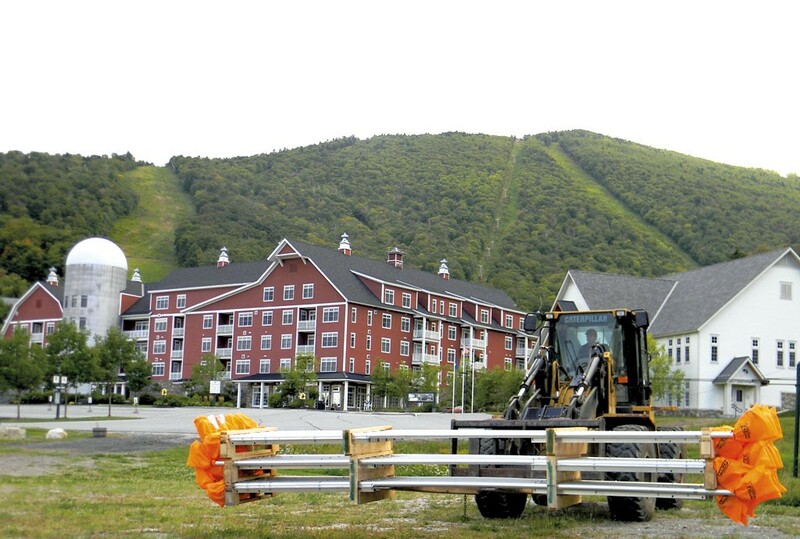 That completed a five-year, $5 million snowmaking upgrade at the Warren resort. It's a smart investment, Bleh suggests, because "the new guns can create a lot more snow and do it earlier in the season." Indeed, with the right weather conditions, high-efficiency equipment can produce 10 times as much snow as the old models, says Stowe Mountain Resort spokesman Jeff Wise. For example, a new gun can pile up 60 inches of snow and expend far less energy than an old gun making six inches under the same conditions. For Stowe, that math presented an irresistible opportunity. The resort has spent $9.8 million over the past three years to acquire 780 high-tech guns and to lay down nearly 20 miles of new pipeline to bring water to the equipment. To close the virtuous cycle that Efficiency Vermont set in motion, many of the old snow guns have been turned into scrap metal, and the proceeds from their sale donated to a learn-to-ski-and-ride program sponsored by Riehle's association. So what's not to like about a rebate program that racks up wins for both Alpine enthusiasts and the environment? University of Vermont economist Art Woolf offers an answer: A regressive tax levied on all ratepayers is being used to subsidize a few private businesses. "Suppose a state legislator proposed taxing every Vermont family $25 to raise $5 million and giving that money to Vermont ski resorts to help them purchase new snowmaking gear," Woolf said in a recent commentary on Vermont Public Radio. "Most likely, this policy would be controversial. Legislators would probably find it difficult to justify a handout of $5 million of taxpayers' money to the ski industry, and many would probably argue that there would be much better uses for it." The state legislature didn't specifically approve Efficiency Vermont's decision to lay a $5 million gift on the state's ski industry, Woolf noted. Merriam sees the dynamic differently. All Vermonters will benefit because Efficiency Vermont "incented" the ski areas to turn their gluttonous snowmaking machines into scrap metal, he argues. Ratepayers get whacked especially hard when electricity demand peaks on cold, dark winter days and nights. Vermont utilities have to pay high prices for power at those times, and the extra cost is passed on to their customers. So, Merriam reasons, "when we lower winter peak demand, we lower everyone's bill." The potential savings, however, are difficult to quantify in dollar amounts, he adds. Because the new snowmakers are more like cannons than guns in terms of their output, they also have the effect of bringing more skiers to towns heavily dependent on resort traffic. "Most ski areas are in relatively remote areas where they're the primary business," Merriam points out. Helping to keep those enterprises profitable can be seen as a good thing for many Vermonters, not just for the resorts' owners. Ultimately, energy savings also serve to save skiers and riders money. There's no specific correlation between the resorts' electricity bills and the price of lift tickets, Stowe's Wise cautions — so don't look for those savings on your next trip to the slopes. But, Wise adds, it's logical to link the overall cost of doing business to the amount customers pay. And, with any luck, Vermont's ski resorts will find the coming winter very white and green indeed. The original print version of this article was headlined "Whiter and Greener"